April’s showers of tears and her testimony are a message of hope for us who are growing . . .
Thursday was a solemn day. I read a story titled “The Cheerleader” about a woman named April who recently lost her home and two young sons in a tornado in Arkansas. After reading about her loss, it didn’t seem right for me to go about my business as usual. I needed some time to process what I read. The timing of her story was so close to my recent blog post about a storm our family weathered a few years ago when I lost my mother to cancer (titled April Showers . . . Bring May Flowers). Writing about my mother’s death and how gardening helped me find hope during that loss, made me sensitive to April’s suffering and prayerful that she would continue to find hope. Although I don’t know her personally, I realize that right now as I’m typing on my laptop, April is in the hospital, hurting. Her family is hurting. Her church and community are hurting with her. I hesitate to write too much for fear of saying the wrong thing, but I don’t think I can go wrong in sharing that this gets to me. Hearing April’s story and knowing that I still had to do be an attentive mom and accomplish some things that day, I decided to work in my garden a bit while our two-year old played outside near me. As her story ran through my mind, I pruned our rose bushes that I planted when my mom lived with us. I always have a hard time pruning my roses. First it’s just painful literally as I always get scratched by the thorns, and second it’s painful visually as I hate cutting away beautiful blooms that are in their prime. But, if I don’t cut them back, the bush will not thrive. Throwing them away seems so meaningless, so, after I cut the branches away from the bush, I gently cut off the rose stems and place them in a vase. They become the centerpiece on our entry way table for me to see and cherish daily. This process brought an analogy to my mind that gave me comfort and a clear way to pray for April and her family. Like the roses I had to cut away in their prime, perhaps these beautiful boys were cut away in their prime to make room, or a way, for others to hear the truth of the gospel and thrive. April’s showers of tears and her testimony are a message of hope. In the middle of her pain, she can still say that her sons are now with their heavenly Father. Their painful pruning has brought them into the presence of the Master Gardener, who wants all of us to grow through their suffering. He will cherish them daily just as I cherish the roses I have to prune in my garden. Today, the centerpiece of heaven is blooming beautifully. *One practical way we can share in their story and contribute to the disaster relief efforts is to donate directly to Daniel & April Smith at ThatChurch.com today! 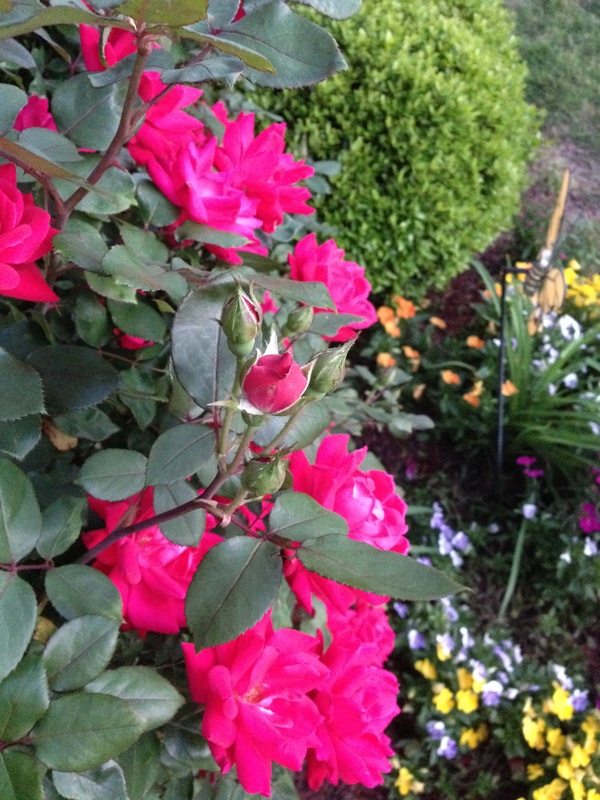 This entry was posted in garden, miracle and tagged analogy, April Smith, April's story, Arkansas, Daniel Smith, disaster relief, gardening, grief, hope, loss, pruning, roses, ThatChurch.com, thehodgepodgedarling, tornado. Bookmark the permalink. I just came across this, months after writing The Cheerleader. What perfect timing and what a blessing your words are. Thank your or sharing your heart!